Rumford Place is named after the two story fireplace and chimney that are part of the living room.The structure is 1200 square feet with a bedroom downstairs and one bedroom with an additional open loft space upstairs. 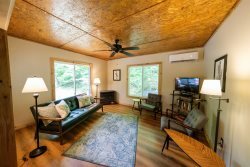 Located next to Natural Bridge State Park and in the Red River Gorge Geological Area, this cabin with vaulted ceilings is the perfect headquarters for enjoying the great outdoors this part of Kentucky offers. There is a 16 x 14 deck overlooking the parking lot with a hot tub that comfortably seats two at a time. Enjoy a nice soak after a day of hiking or climbing! Rumford is part of Quiet Waters Cabin Complex: 5 cabins that are connected by wooden decks and walkways. The location of Quiet Waters is central to many attractions of the area: right next to Natural Bridge State Park and Mill Creek Lake and a short drive to the several restaurants along Highway 11. Also near main trail heads and tourist activities such as underground kayaking, adventure courses and rock climbing for all ages and abilities. -There is a small family cemetery in a grassy area to the side of the cabin complex. It is viewable from the parking lot and the deck/hot tub of Rumford. -The cabin includes toilet paper, pots, pans, dishes, dish soap, dishwasher soap and hand towels. There is an oven, a four burner stove, a coffee maker, a microwave, a refrigerator, and a toaster in the kitchen. There is a propane grill on the porch. Each guest is provided with one towel for your stay. We provide sheets, blankets and pillows. BRING your own salt, pepper, cooking oil, paper towels, shower soap and shampoo.